Iowa college-bound students have quite a bit to choose from if they are in the market for state-specific loans to help them pay for their undergraduate or graduate eduction. The best way to create a complete financial package that will cover the costs of tuition and any other expenses you may have is to shop around for the lender that is right for you. You should be looking for low-interest loans with flexible repayment options and the choice to consolidate if necessary. 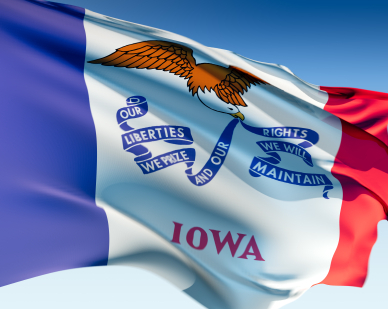 In this market are the Iowa Student Aid Commission and Iowa Student Loans, two organizations that will be of interest to any student going to college in Iowa. The Iowa Student Aid Commission (ISAC) calls itself “Iowa’s Source for Everything Higher Education” and it is no exaggeration. This government-sanctioned loan guaranty agency is solely devoted to assisting Iowa students in finding appropriate funding for college. The Commission provides a clearing house for other forms of college funding, as well as the Iowa Federal Family Education Loan Program, scholarships and grants, and advice on saving and planning for college expenses. Part of the job of the Iowa Student Aid Commission is to solicit for viable not-for-profit lenders who are able to offer federal, as well as alternative or private, student loans to Iowa students. ISAC is legally bound to provide all lender information without bias, which means students may choose whichever lender they’d prefer for their financial aid loans. ISAC is a great resource for those looking to compare rates and features of various loans before they commit to one. Private, or alternative, loans may also be available through Iowa Student Loan. Alternative loans like this are a great way to supplement whatever education expenses you have that federal loans or scholarships do not cover. These loans are based on availability and the lender’s current ability to offer affordable programs, but if you can find them they can make up a significant part of a financing package. Many lenders offer students a number of options for repayment that include a variety of rate plans with different features as well as upfront deferment of interest. There are countless methods that you can go about paying your loans with varying advantages or disadvantages, but in the end the goal is to pay them off in the cheapest, fastest, and least stressful manner. You may choose to either begin repaying interest while still in school or defer until you’ve graduated or dropped below half-time. Remember, interest accrues and can really add to the cost of your loan, transforming it from a reasonable monthly sum into a massive bill that you may not be able to afford. Many lenders will advise borrowers to make interest payments if at all possible to avoid this possibility. There is a general grace period of about six months after a student graduates that they must start paying off their loans, but even given that time, many students are still floundering in the job market and unprepared to make that monthly payment. Consolidation, in these cases, is a viable option. Because almost every college graduate these days is juggling multiple student loans, both federal and private, consolidation has become a popular and savvy way of dealing with overwhelming student loans. If monthly payments become unwieldy and costly, and you are given the choice between defaulting on one or more loan repayments or applying for a consolidation loan, choose the latter. Your payments will decrease and go on for a longer period of time, and you will be given more freedom and an extended term to complete them. Consolidation loans are often available through your FFELP or a Direct Federal lender and may be available for your private student loans as well. Ask your financial adviser or lender how to bundle together costly multiple loans, and they will probably present you with a variety of ways that this can happen in your particular case. The resulting loan will feature significantly lower interest rates, lower monthly payments, but will have a lengthier term of repayment. Best of all, a consolidation loan can also save you from defaulting on your loans and ruining your credit, so take advantage of this option if a default looms in your future.